One of the ideas that I find most exciting within planetary science is finding life on other planets. I’m not the only one: Astrobites has seen a lot of discussion about planet habitability this year. Courtney blogged about habitability in interstellar space and discussed a conference on astrobiology. Sukrit discussed how dark matter could affect habitability, and I talked about how global circulation models can be used to model potentially habitable planets. Now, astronomers who specialize in galaxies and galaxy evolution have started to weigh in on habitability from a completely different perspective. Instead of trying to determine the zone around a star where an orbiting planet could sustain life, they are modeling the zones within the galaxy where planets that harbor complex life would be most likely to form. They dub this zone the Galactic Habitable Zone, or GHZ. The general method to determine the GHZ is to build a galaxy of stars, vary some parameters, and then analyze where planets are likely to form and exist in stable enough environments for life to form. The authors begin by choosing two different initial mass functions (Salpeter and Kroupa) and two different stellar density distributions. These sets of assumptions give them four different galaxy models with different proportions of stellar masses and density distributions of stars. For each model, they include the known radial dependence of metallicity in the galactic disk; we have observed that the average metallicity of the outer disk is lower than the inner disk. The probability of life forming in different regions of the galactic disk is then assessed. If a supernova occurs too close to a potentially life-harboring planet, any life on that planet is probably killed because of the fast influx of cosmic rays, gamma rays, and X-rays. A self-consistent model for the occurrence of supernovae is included in this analysis. Stars of a high enough mass become Type II supernovae at the end of their lives, and about 1% of smaller stars become Type Ia supernovae after becoming white dwarfs. The supernova rate at a given part of the galaxy is slightly different for each of the four models tested because the sizes and densities of the stellar populations varied. Radiation from Type II supernovae will destroy the protective atmospheric layer in planetary atmospheres within about 8 parsecs of the explosion (about 20 parsecs for Type Ia supernovae). This means that it becomes difficult to sustain life in very dense regions of the galaxy which are more likely to be bombarded with supernova radiation. 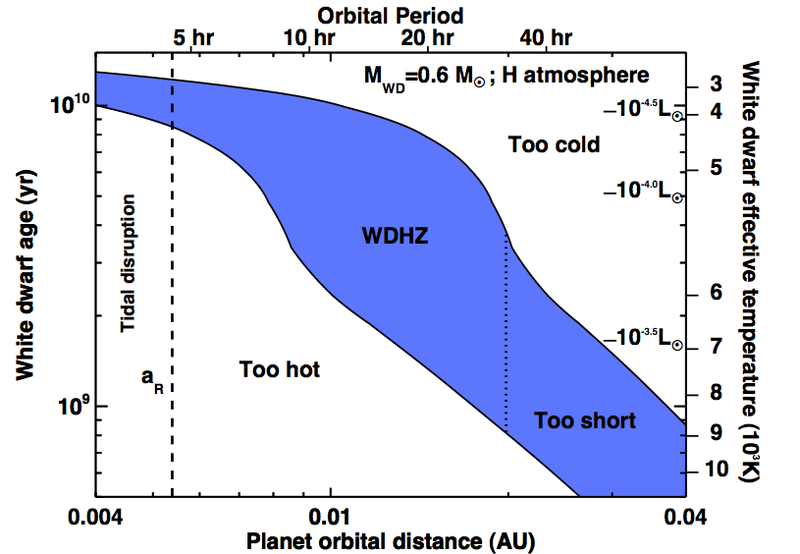 The authors use planet formation models to find the probability that planets will form within the stellar habitable zone (where liquid water could exist on the surface) around each of the stars in their model galaxies. They use the planetary formation simulations to determine the likelihood that a gas giant will migrate inwards to become a Hot Jupiter, which would kick a habitable planet out of the system. Planet formation seems to be dependent on metallicity, so more planets in the habitable zone are found in the inner regions of the galaxy, where stars are generally more metal-rich. Planets that have been around long enough (~4 gigayears) for complex life to evolve. They find that between ~1.2% and ~1.7% of stars host a habitable planet , and that the greatest number of habitable planets exist in the inner galaxy in all of the models. (This result is different from previous studies which suggested that the inner regions would be bombarded too frequently with supernovae, but used a less sophisticated model for supernova rates.) In this analysis, the higher number and metallicity of stars in the inner regions seem to outweigh the higher level of supernovae disruption. 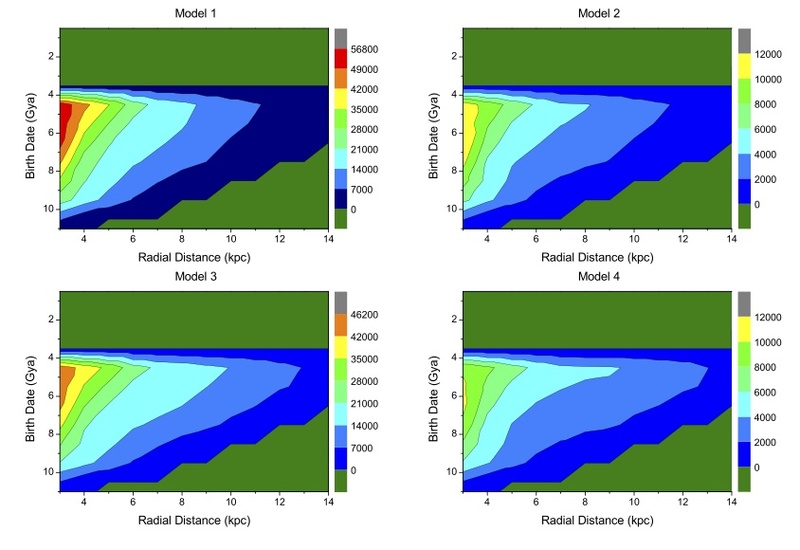 The GHZ and how it evolves in time for each of the galaxy models is shown in the figure. The radial distance from the galactic center is plotted against the birth date of each planet; the color represents the number of habitable planets per parsec. 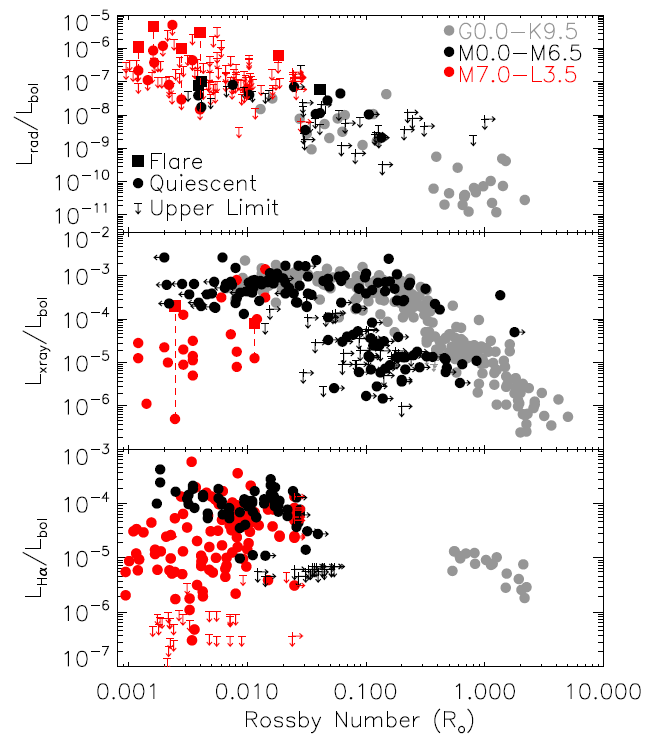 Models 1 and 3 use the Salpeter IMF and Models 2 and 4 use the Kroupa IMF, with two different stellar density distributions. The number of habitable planets is greatest in the inner galaxy for all models. This study represents an excellent step to understanding the galactic-scale factors that affect habitability. The authors suggest that this analysis will be greatly improved by a better census of planetary systems in the Milky Way, which, as previous Astrobites have discussed, the Kepler space telescope is beginning to provide. Caroline, How many stars do you estimate are in an idealized Galactic Habitable Zone? I suggest that such an idealized GHZ might be the volume of a torus with a cross section of 30 light years in diameter, with the cross section centered on our sun? Would the dimension ratios of the torus appear a lot more like a thin round rubber band than a bicycle?